Why did I read this book: I’d been seeing some great reviews for this title, so when I stumbled across a copy at The Strand, I immediately swooped it up. I mean, secluded island, secretive society, sea monsters… how could I resist that siren song? Warning: Slight spoilers included below! After her mother dies, seventeen year-old Delia McGovern is shuffled from foster home to foster home, causing trouble because of her incessant need to do the right thing (even if that means calling child services on a foster-mother that chooses to smoke in the car with an infant). After her last foster family gives up on her, Delia convinces her caseworker from Social Services to let her spend the summer with her only relative, an estranged grandmother. Delia leaves landlocked Kansas and makes her way east to the New England coast to find her grandmother, who lives on the small, isolated Trespass Island off the coast of Maine. Immediately, Delia immediately knows that something isn’t quite right about Trespass. For one, no ferries go to the island, not even those for hire. For another, the island itself is shrouded in mist and mystery, protected by seemingly supernatural forces. When Delia finally arrives on Trespass, she’s greeted with cold hostility, especially from her grandmother. No one comes to the island, and no one ever leaves – that is, no one except Delia’s mother. As the days pass, Delia learns Trespass’s darkest secrets – its history of shipwrecks and curses, monsters and gods. And, in the midst of all these secrets, Delia’s own past, her own inexplicable changes and abilities, come to light. Delia is the key to breaking the cycle of despair and the oppressive shackles of tradition on Trespass Island, but it may come at too high a cost. 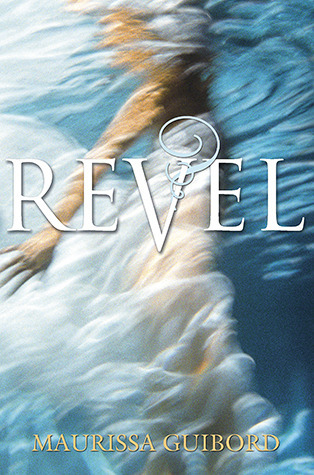 At first glance, Revel may seem an utterly traditional and unremarkable paranormal YA novel. You have your typically sweet and delicate/china doll-like heroine (“You’re so tiny. Like a little china doll.” – direct repeat quote, by the way). Of course, this girl ends up being Super Duper Special, with unparalleled powers in a surprising TWIST. You have two hunky love interests (one sweet and down to earth, one supernatural and mysterious). You have a twisted, secretive society that has ridiculous, sexist traditions (in which sixteen year old girls are offered up as mating/incubation vessels for the supernatural creatures). There’s also the familiarity of the mythology, and Percy Jackson-ish factor to the text – this is a book about demi gods, and children of Poseidon, no less. I thougth of the men out there…about the curse that kept a sea captain and his men trapped here. About girls giving themselves because it was tradtion. I was so angry, the gasoline was probably overkill. My rage could have burned that field to ash. YES. This. Also helpful: the “love triangle” is not really much of a love triangle, and it’s resolved within this single book without any copouts or concessions (that said, of course, the boy Delia picks is thanks to a brand of instalove). While the thematic core of Revel is strong, it’s not without its weaknesses. From a writing perspective, the mythology and worldbuilding behind the book is interesting – curses, a Wicker Man-ish type of society, Greek mythology – but a bit cumbersome and not entirely convincing. In particular, the threat that faces Trespass Island in the form of invading monsters, and the betrayal at the heart of the plot, feels half-baked and tertiary to the story. I love the revelations of Trespass and its society (the truth of the sea monsters that guard the island, the secret of the “Hundred Hands” and the Old Ones) but everything felt a little…rushed. The images are wonderful (seriously, the image of the glaukos transforming bit by bit, or the truth of the protective reef surrounding Trespass are haunting), the writing is competent, and the characters are all decently fleshed out, if a bit melodramatic – the only thing missing is that essential sense of buildup and tension. These criticisms said, I still enjoyed Revel thoroughly and can certainly recommend it. Hmm. I read and enjoyed WARPED by this author, so I was curious about your thoughts on this novel. I love the lines you included. I’ll give this a shot. Oh, dear. I am SO TIRED of instalurve and Triangles of Doom, and Greek mythology is becoming the new vampires. This book looks like it can be fan fiction for the twilight saga smushed into one 340 pg story. The girl has left her home town to visit her grandmother on a tiny misterious island called trespass island. Just like Bella leaves her moms home to go her dads home in Seattle. Wich in both story’s the girls are not comfortable with. Long story short the girl meets a guy and you can tell that they may have something going on. Just like Bella meet with Jacob. Then the girl meets another boy just like when bells meets Edward. Botha girls have an exterme fascination with these boys and in both cases the boys save the girl. In revel, the boy saves the girl from drowning and in twilight Edward saves Bella from the car. Then the girl starts to fall hard for the guy who saved her and the boy she met first is starting to fall for her. Then the boy who she is falling hard for turns out to be a demigod and the boy that is falling for her tens out to be transforming into some type of monster like Jacob was transforming. Then the girl finds out she is a demigod and together she and her demigod boy save the island from the bad demigods and the monster boy who is like Jacob helps them fight the bad things. Call me crazy, but these two story’s are exactly the same.